might make one think that a solid-state amp had been hooked up by mistake"; bass in particular displayed "sheer power, yet refinement and delineation." Features Push-pull ultralinear 100Wpc mono tube amplifier "populated with a quad of Electro-Harmonix-branded (Soviet-sourced) EL34s, a Manley-labeled Ei 12AT7, and a NOS GE 7044"; balanced and single-ended inputs; load selector for balanced use. Use "The absolute quietest tube amplifiers" Bill has heard via their balanced inputs, sound their best used this way too; output tubes are individually biased, so a matched quad is not necessary. Value "The Snappers are must-hear amps for anyone who craves the tube glow but lacks the desire to be forever in debt." Sometimes its really, really hard to be an audio reviewer. Theres a constant backlog of components clamoring for a spot in the reference system, and the cutting edge keeps getting sharper. Its tougher and tougher to get a real lemon these days. What keeps hitting my doorstep is yet another component that while sounding different than the one preceding it is rarely less good in absolute terms. You might think that this makes things easy. Pleasant? Yes. Fun? Yes. Easy? No, as it becomes difficult to find gross faults, and even more difficult to pick out the notable qualities, both good and bad. 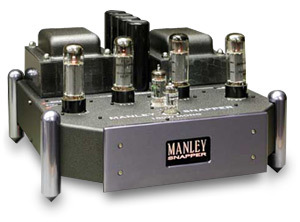 Im happy to say that the Manley Snapper amps were chock full of the good qualities, but read on anyway for the details. The Snappers are a nice departure from the ubiquitous black box, with their multi-angled chassis finished in a textured black paint with integral gun-metal-blue towers that terminate in very pointy feet. The tube complement sits out in the fresh air, with neatly silk-screened logos identifying the tube type with its corresponding socket. I wont spill more ink on the appearance, as the accompanying photo gives you a much better idea of the ultra-cool aesthetic of these amplifiers than I can possibly do in words. Each amp is populated with a quad of Electro-Harmonix-branded (Soviet-sourced) EL34s, a Manley-labeled Ei 12AT7, and a NOS GE 7044. Up front, a backlit "Manley Snapper" logo plate sits centered in the thick, brushed-aluminum faceplate. Around back, the busy, yet intelligently laid-out panel sports a fused IEC power receptacle with an integral main power switch. Single-ended and balanced inputs are included (with a toggle switch for selecting the one in use), an input impedance selector switch (more on this later), and a pair of ultra-nice WBT speaker binding posts finish things out. Each amp weighs in at roughly 40 pounds, and measures 15" deep x 13" wide x 8 3/4" high. At $4250 USD for a pair of 100-watt tube amplifiers, the Snappers are very attractively priced. Ill direct you to Manleys website and their truly humorous operation manual for a more thorough (and quite excellent) description of the circuit employed. I got a glimpse of the manual just before press time and can assure you that it will be worth your reading -- I found it more entertaining than some audio magazines I read. Setup doesnt get much easier, especially for a tube amp. After input, speaker, and power cables are connected, its simply a matter of flipping the power switch and checking the negative bias setting on the output tubes. This is pretty simple too, accomplished by inserting the probe from a standard voltmeter into a spring-loaded socket adjacent to each tube. Yes, its a little more work than biasing an amp that has one test point for all the output tubes, but it offers one key advantage -- as the tubes are individually biased, the need for a perfectly matched quad of tubes is nonexistent. 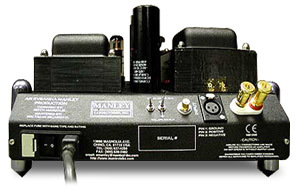 Manley indicates at least several years of life can be expected from the output tubes, as they are run at fairly conservative voltages. The factory-recommended negative bias voltage is 300 millivolts per tube, and while I noticed some small drift during the first 100 hours of operation, beyond that point bias remained rock-stable. According to Manleys chief, EveAnna Manley, 300 millivolts is the setting that offers the best operating point for the EL34s in this push-pull, ultralinear circuit, and she does not recommend altering this setting. So, being a good boy, I set the tubes accordingly, and all review comments below were with the amps locked into this bias voltage. A few other words of advice, warning, or whatever you might wish to call them: (1) do not apply power to the amp without a speaker load connected, and (2) assure that the negative speaker lead is hooked only to a speaker post, not to an earth ground. Doing otherwise may cause a very short life for the output transformers, and a trip back to Chino, CA for repairs at your expense. Like most manufacturers, Manley does not offer warranty coverage for misuse or general stupidity. I placed the Snappers on my favorite amp platforms -- the excellent and sanely priced Greater Ranges Neuance shelves. In the four months that the Snappers saw (considerable) use in my system, I didnt have a single problem, not even so much as a burp of anything but music. Further, when the balanced inputs were utilized, the Snappers were the absolute quietest tube amplifiers Ive yet had in my system. With no source playing, there was only dead silence, even with my ear jammed into the speakers tweeter. No hiss, no "tube rush," no nothing. In fact, when I first tried this, I even wondered if Id forgotten to turn the amps on! There was a little noise evident when I ran the single-ended inputs, but even the noise level there was quieter than most any other tube amp Ive used. Additionally, the chassis of both amps had no tactile vibration -- something that is unusual for any tube amplifier Ive experienced. The power transformer got just warm to the touch after many hours of hard rockin, and the output transformer never rose much above room temperature. Being technically illiterate, I cant tell you whether such traits add to the sonic goodness, but I think it safe to say that they certainly dont detract from it. With options for running the Snappers with both single-ended and balanced inputs, I gave both due listening time, using cables gratuitously provided by Shunyata Research. The single-ended cables offered a slightly more forgiving, more diffuse sound, curtailing some of the overall dynamic prowess and bass authority that was conveyed when run balanced. The balanced inputs offered a blacker background, and a better sense of rhythm and pace, in addition to the aforementioned qualities. Dont pass the Snappers by if you have only RCA capability, but if balanced operation is an option, go with it. Finally, an input-impedance-selector switch is located adjacent to the balanced input jack, allowing the user to choose between a 600- and 15k-ohm input impedance. The 600-ohm impedance is included for the professional (i.e., recording) market, with the associated gear that is typically happiest with this load. For your usual audiophile preamp, the 15k load is best. There is no harm in trying either, but the latter was decidedly superior in the context of my decidedly non-pro equipment. The first quality that becomes evident with the Snappers is a bold, gutsy, dynamic, and bass-hammering sound that, were it not for the beautiful orange tube glow emanating from the chassis, might make one think that a solid-state amp had been hooked up by mistake. The Snappers are not your fathers Oldsmobile. If the word tube means sluggish, soft, and compromised at the frequency extremes to you, then youre either still living in the 60s or havent bothered to check out amps like the Snappers. Loudspeakers  Coincident Speaker Technology Total Eclipse. Amplifiers  Audio Electronic Supply Super Amp stereo amp and Cary Audio Design 280SE "V-12i" monoblocks. Preamplifier  Cary Audio Design SLP-2002. Phono stages  Art Audio Vinyl One, Audio Electronic Supply PH-1. Digital  Cary Audio Design 306/200 CD player. Analog  Eurolab Premiere turntable with 80mm platter, Graham 2.0 tonearm with 2.2 bearing upgrade, Zyx Fuji and Benz-Micro MC-SCHEU cartridges. Interconnects and speaker cables  Shunyata Research Aries interconnects and Lyra speaker cables, Omega Micro A-7 interconnects, Graham phono cable. Power conditioners and power cords  Shunyata Research Hydra power-distribution center, Shunyata Research PowerSnakes Anaconda Vx, King Cobra and Diamondback power cords. Accessories  Black Diamond Racing cones and Round Things, Solidsteel and Target racks, ASC Half Rounds and Tower traps, Michael Green Designs Pressure Zone Controllers, Marigo Audio Labs VTS tuning dots, Walker Audio Ultimate and Standard Valid Points, both racks fitted with Greater Ranges Neuance shelving for all components. Cueing up the old classic, Pink Floyds Dark Side Of The Moon [EMI 24385 98651] on vinyl, of course, gave a perfect glimpse of the Snappers capability in the lower reaches. The heartbeat on "Time" produced an eerie backdrop, providing a perfect complement to the instruments and vocals, rather than disappearing or being overpowering. I had a blast with the bass capabilities of the Snappers, pulling out disc after disc of low-frequency wonders, marveling each time with the sheer power, yet refinement and delineation in that frequency range. With any disc containing copious amounts of low-frequency information, the Snappers gave the side-mounted woofers in my Total Eclipse speakers a run for their money. Neither ever gave up the ghost, but I sure had a lot of fun trying to do one of them in. Moving on to that super-critical audiophile parameter of soundstaging, "Chan Chan," from Buena Vista Social Club [Classic Records RTH-79478], is a soundstaging tour de force with sounds whirling around the soundfield as if audio components didnt even exist in the room. Width and depth with the Snappers were both excellent, although the amps gave up just a bit in the three-dimensionality department compared to some SET and full-triode push-pull amps Ive listened to lately. But with the watts-per-dollar ratio involved here, dont get too cranky about this. Its a minor observation, not a failing. David Lanzs Finding Paradise [Universal B00005YMDH] has become another one of my staples, with exemplary sonic quality in addition to the groovin tunes. I guess its new age, or maybe its jazz, and Ive never particularly cared for either genre. I like this guy, though. Its an HDCD-encoded disc, but for whatever reason, I prefer it with the HDCD disabled and the 24/192 upsampling of the Cary CD player employed. Through the Snappers, I got some of the best rhythmic drive and sheer impact that Ive yet had from my system. Sounds that were previously an accompaniment were now a driving force of the music, and not in an obtrusive or hi-fi-ish manner. Further, as Ive listened to this disc countless times over the past several months, it provided a nice glimpse into the natural, even-handed frequency response that the Snappers brought to bear. Perhaps the measurements will show differently, but I found nothing audibly out of kilter with the Snappers. I dont generally bother with audiophile discs these days, and Jimmy Thackerys Wild Night Out [Blind Pig Records 1914-85021-2] is one of my favorite non-audiophile recordings (even though it sounds pretty darn good). On "If You Go," the melodic, fuzzed quality of Thackerys guitar comes through with all the emotion and blend-fade soul that makes this piece so memorable. "Trouble Man" lets loose with some, well, not entirely musical pyrotechnics, but the dynamic contrasts serve as a perfect test bed for a component's ability to swing the scale from silence to extreme loudness. The Snappers were unflappable in this regard -- they made even un-music sound pretty cool. Part of the process in any review is to pick a few nits, and just to be consistent, here are a few. In describing the sonic behavior in absolute terms, when the Snappers are pushed hard, they can take on a bit of stridency and become hard-sounding. Note that this was only when pushed to very loud levels, and may not even be discernable with relatively sensitive speakers played at reasonable volume levels. Further, the Snappers will never be sonically mistaken for a SET amp, as they dont have that utmost inner detailing and fleshed-out nuance that good SET amplifiers possess. In the ranks of their push-pull ultralinear brethren, the Snappers can best be described as muscle amps, kicking sand in the face of all those 98-pound-weakling wannabes. If your sonic manifesto is one that prizes politeness and that fresh-from-the-oven chocolate-chip-cookie aroma that Mom used to create, then go on down the street. If you want to party with the bad boys, hook up the Snappers and run the 98-pounders clear out of town. Amplifiers on hand for comparison were the nearly double-the-price Cary V-12i monoblocks (with six times the number of output tubes), sporting the same output power level in full triode, and considerably more when run in ultralinear. At the other extreme was the one-quarter-the-price Audio Electronic Supply Super Amp, running half the tubes and, at just 15Wpc, offering considerably less power. Head to head with the V-12i amplifiers, the Snappers were a contrast in finesse. Where the Snappers had the edge in rock and sock, the V-12is brought about a more introspective glimpse into the music. Its not that the low-level details were obscured by the Snappers, but more that their overall dynamic abilities put those details further back in the mix. This is not unusual when contrasting a full-triode amplifier with one that is run strictly in ultralinear. The Cary amps didnt have as much bass slam or punch, but they were a little more refined in the midrange and upper frequencies. And due to their full-triode operation, there was a better layering and airiness to the soundstage. But remember that were talking considerably greater expense -- both in up-front cost and tube replacement when necessitated. Moving on to the inexpensive Super Amp, the Manley showed its command with its ample power reserves. But within comfortable volume levels that let the Super Amp show its best face, the differences were not quite as vivid. The Super Amp carries forth the traditional Cary sound, showing the kindly, involving tubular triode voicing, versus the more forceful, "Heres your music, buddy" approach of the Manley amps. To say that both amps were enjoyable would be an understatement, but the Manleys would be the clear choice with a speaker load that demanded some oomph and gumption. I spent many an hour in musical bliss with the Manley Snappers providing the main juice for my system. With a compact, artfully cool chassis and a power output that will likely satisfy the great majority of speakers they will be partnered with, the Snappers are must-hear amps for anyone who craves the tube glow but lacks the desire to be forever in debt. If you want a heaping dose of tube bloom and syrupy lushness, the Snappers wont likely be for you. But if you want your tunes served up in a gutsy, highly dynamic manner with a major serving of that inner righteousness that only tubes seem to provide, then the Snappers should be on your audition list. Price: $4250 USD per pair. Warranty: 90 days, five years with returned warranty card; six months for tubes.